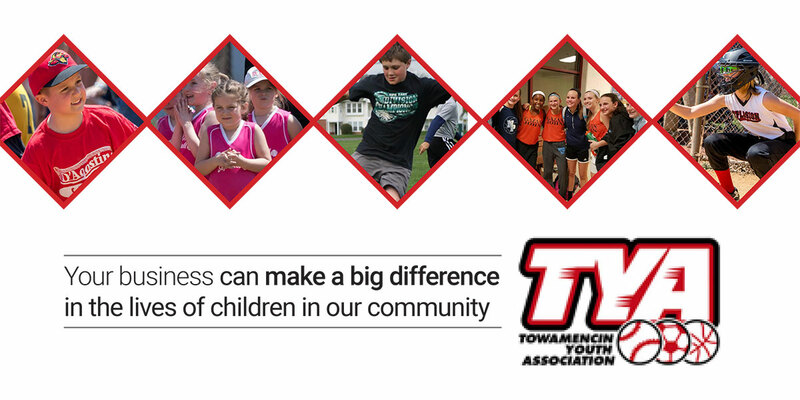 Every year, 2,000 young athletes take to the fields and the courts to participate in TYA sports. With help from business and community partners, our organization provides opportunities for health, wellness, play, sportsmanship and teamwork. The 2019 sporting year promises to be an exciting one and we invite our sponsors to stand with us for youth development and community partnership. This year's sponsorship program includes new and exciting opportunities for the marketing of your business and for engaging with our large and growing community of families and online followers. Download the 2019 Sponsorship Packet and Sign-Up Form to find our more. Get affordable and effective sponsorship package options! Put your business name on the uniforms of multiple teams! Take advantage of new and timely advertising and promotional opportunities! Provide a $50 registration credit to the young athlete you designate on your sponsor sign-up! Most importantly, help more than 2,000 young athletes know they live in a great community where parents, coaches and sponsors care about their well-being! Fill out the Sponsor Sign-Up Form and get started today! With the support of these businesses and community partners, TYA provided high-quality youth sports for more than 2,000 athletes. Please patronize these businesses and let them know that you, too, are a supporter of Towamencin Youth Association. DCO Orthodontic Specialists Merrymead Farm Trefz Mechanical, Inc.
Elite Sportswear/Total Equestrian Ent. North Penn Education Association Universal Electrical Services, Inc.
Environmental Engineering & Management Associates,lnc. North Penn Gulf Univest Bank & Trust Co.